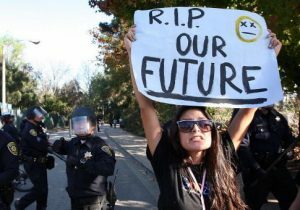 A record 11 percent of the 44 million former college students with outstanding loan debt now sit in default—far beyond the 8.6 percent peak in mortgage defaults at the height of the housing crisis that caused the Great Recession—according to the Student Loan Report. Nearly half of all those in default, 48.6 percent, said in a survey that they never obtained a college degree, while 33.8 percent have not made a single payment on their debt. The majority of those in default have more than one student loan outstanding with 11.2 percent saying they have four or more debt payments to make. The majority of respondents said they entered default because of their inability to find a good-paying job (30.85 percent), lost their job (22.62), or lived in communities with high living expense (28.52 percent). Just 39 percent of the defaulters said they had full-time jobs. Student loan debt is now largely backed by the federal government and carries unique terms compared to traditional credit card or mortgage loans. It cannot, for example, be discharged in bankruptcy courts. Many are hoping their creditors, whether private or federal, will simply forgive the debt with 48 percent saying they expect lenders to eat the loss. That is unlikely to happen, according to the report. "While this would be nice for those borrowers, student loan forgiveness is pretty difficult to qualify for," it said. "Most people have to make payments for an extended period of time under the public service loan forgiveness program or another program that have strict eligibility requirements." The majority of borrowers are taking responsibility for their financial situation. About 60 percent say they are to blame for taking out the loans and failing to pay them back, while 73 percent said they have made plans to begin making good on the payments. Still, many defaulters do not see themselves ever fully paying off the loans. One-in-four respondents in the 500-person survey saw themselves as likely to escape the debt; 21.6 percent meanwhile said it was "very unlikely" they would ever pay it off. Part of the problem stems from the ignorance many borrowers have about their debt. It takes 9 months of consecutive non-payments to attain default status, but only 13 percent of respondents were aware the fact. Of the remaining 87 percent, 30 percent believed they had 12 months to make payments before entering into default and suffering a hit to their credit scores.